If you’ve ever volunteered with a charitable organization that takes donations, you will probably have come face to face with some of the ridiculous, useless and downright disgusting things some people donate. Broken furniture or appliances, stained or ripped clothing, damaged toys and books and more. It’s like they forget that recipients of donations should be treated with humanity and care. If you wouldn’t wear it or use it, why would you expect anyone else to? Thank goodness that’s not the majority of people. Most donations are very generous and the charity’s welcome each and every one of them. Inappropriate donations do happen though and that means that the charity has to spend time and money weeding through the garbage to get to things that that they can use / resell. Time and money that they don’t have to waste. DO go through all the clothes carefully! You want to be sure that whatever you are donating is in excellent used condition: no rips, tears, or stains. What else? Divide the clothing by age and season. 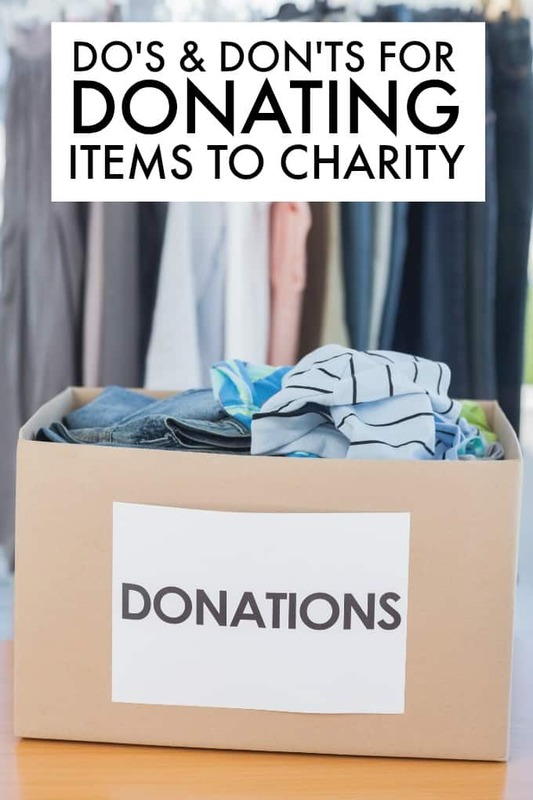 Most charities will take clothes that are out of season but it’s a burden for some to have to store the clothes so try to stick to seasonal donations. Check all the pockets on pants and coats to make sure you haven’t left anything in them. Wash all the items – it’s not necessary to dry clean them but they should at least be freshly washed. Fold them and box or bag them, ready for delivery. Your old eight track player is not a vintage antique: it’s useless. Donating obsolete or broken items leaves the charity with the effort and cost of disposing of items they can’t use. What else? Test small appliances, battery operated tools and other electrical items to make sure that they work. If they don’t, it’s time to recycle or dispose of them per your city by-laws. Go through dishes, pots and pans to make sure they aren’t damaged or chipped. Make sure games, puzzles and other toys have all the parts they need. Nobody wants a puzzle with five missing pieces! I once left a VISA statement in a book—I had been using it as a temporary bookmark—so it was a good thing I went through the pile of books I was planning on donating! Check kids books in particular for scribbled on or ripped pages. CDs and DVDs are prone to scratches and damage so make sure they’re in good condition, in their rightful cases, before donating them. Typically, large appliances like stoves, refrigerators and washer / dryers are not eligible for donation but there are some exceptions. Beds, mattresses and boxsprings are often not accepted anymore, because of the threat of bed bug infestations. Best to dispose of these separately. Some items will best serve a specific charity. For example, the bridesmaid dress you bought for your sister’s wedding and will never wear again? It could be reused as a prom dress through a charity that helps kids get kitted out for their big night but can’t afford it! Business clothes, suits and accessories are sought by organizations that help people returning to the workforce after a period of homelessness or incarceration. Unused pet supplies to an animal shelter. This can be a good place for towels and blankets, which can’t be donated in other places but might be readily accepted for the animals to make use of. Unused baby or hygiene supplies to a women’s or homeless shelter. If a charity requests that items be placed in plastic bags, don’t use boxes. There is a reason they’re asking you to do it their way. Particularly if they are picking up the items from you, it’s kindest to adhere to their requirements. Check their website for what each charity needs / wants and how they would like to receive it from you before setting out! Most of all, DON’T leave your donation at the door of the charity, unless they have a receiving box, when it’s closed. With just a little thought and a lot of care, you can make a difference in someone’s life who needs it. It just requires some effort but it’s worth it!